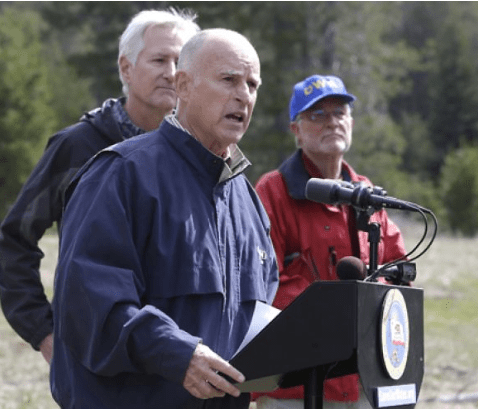 A study by Hews Media Group-Community News shows that the assignment of water conservation tiers by the California State Water Resources Control Board, made up of Brown appointees, was politically motivated. Photo courtesy Foxnews.com. A Hews Media Group-Community News investigation has found that the California State Water Resources Control Board (SWRCB), an unelected body made up of members appointed by Governor Brown and by Senate Pro Tem Kevin DeLeon, and stacked heavily with environmentalists and labor leaders, has deliberately assigned higher levels of water conservation to water agencies located in districts with seats held by State Senate and Assembly Republican office holders as opposed to agencies in the districts of Democratic office holders. Further, the investigation reveals that, as the penalties for non-compliance have increased from 1,786 in May to 29,500 in July, a jump of 21,798, 75%, were issued in Republican Senate and Assembly districts. The investigation also reveals that, of the highest penalized agencies, 90% were in Republican Senate and Assembly districts. Penalty numbers showed a similar pattern for August. In April of this year, Governor Brown issued an Executive Order calling for all state residents to meet a mandatory statewide average of 25 percent water conservation. The order required all water agencies and residential users to reduce their water consumption in 2015, compared to their actual water use in 2013, the base year for comparison. The SWRCB was given free rein for implementing the Order’s consumption reduction target and devised “conservation tiers” it says were based on average use of gallons per capita (person) per day (GPCD) within each of the state’s over 400 water agencies. The tiers ranged in cutback from a low of 8 per cent to a high of 36 per cent. The findings that agencies assigned to higher tiers correlated with locations in districts held by Republican office holders stemmed from an analysis of a SWRCB “Excel” spreadsheet document of initial conservation tier assignments posted online in April 2015. The document assigned the initial conservation tiers to over 400 water agencies/providers. The water agencies reported their GPCD to the SWRCB which used the usage to calculate minimum and maximum GPCD tiers, then assigned a conservation standard to meet the 25 percent average target. On its surface, the tier assignment formula made complete sense. If water agency users consumed less gallons per day in 2013, they were assigned a lower conservation standard than those water agencies with users consuming more gallons per day. With SWRCB’s conservation tier formula, the assignment of conservation standards using GPCD should have removed any possibility of politically skewed results. That is, until HMG-CN assigned water agencies by their location of service to the State Senate and Assembly district office holders in SWRCB’s spreadsheet and found a strong statistical correlation of tier assignments to political party affiliation. What is even more difficult to explain, the findings of systematically higher conservation tier assignments to Republican districts holds true whether the water provider was located in rural areas, urban or suburban zones, coastal or inland regions, north or south locations, or any of a number of other qualifiers. And the correlation related to political party increases as the analysis moved through the tiers, with Republican and Democratic party office holders nearly equal in likelihood at tiers 6-7 then becoming most extremely biased to Democratic districts at the lowest Tier 1 and Republican districts at the highest Tier 9. Tier Two, the lowest tier at 8%, contained a total of 24 Senate and Assembly office holders. 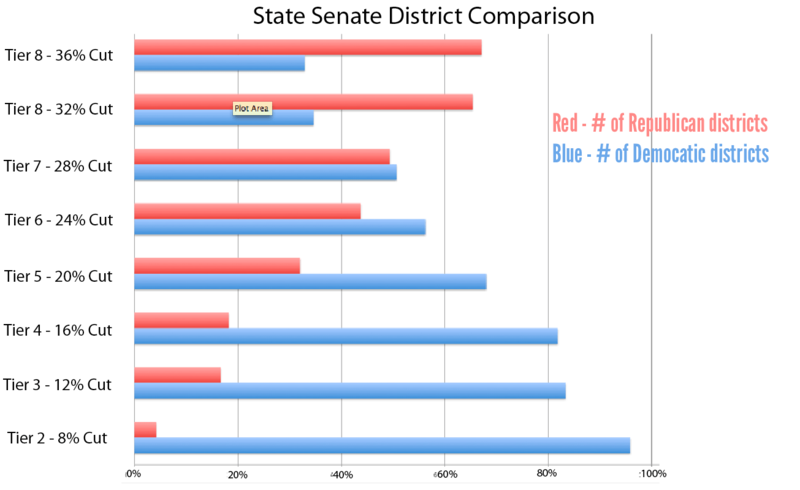 In the Senate, 95.8% – 23 offices – were Democratic, while only one district was Republican. In the Assembly, 87.5% – 21 offices – were Democratic, while only three districts were Republican. Tier Three, with a water conservation goal of 12%, again contained a total of 24 Senate and Assembly office holders. In the Senate, 83.3 % – 20 offices – were Democratic, while only four districts were Republican. 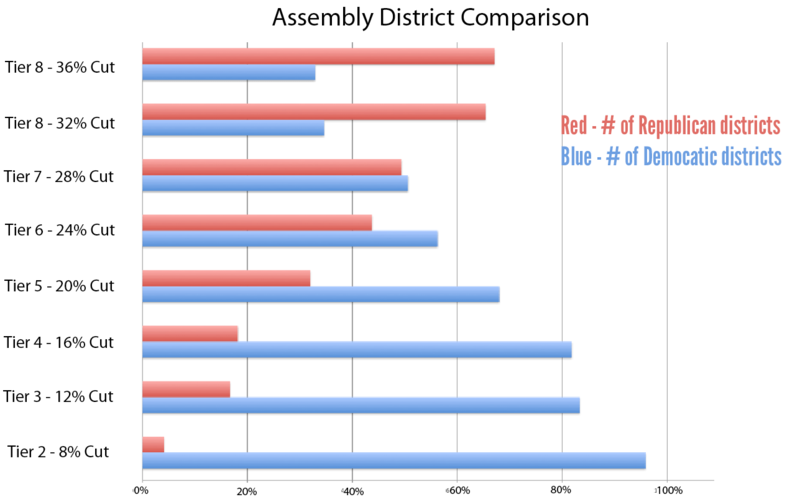 In the Assembly, 75% – 18 offices – were Democratic while only six districts were Republican. Tier Four, with a water conservation goal of 16%, contained a total of 44 Senate and Assembly office holders. In the Senate, 81.8% – 36 offices – were Democratic, while only eight districts were Republican. In the Assembly, 86.3% – 38 offices – were Democratic while only six districts were Republican. Through the first four tiers, the study found an average of 87% of the Senate districts and 83% of the Assembly districts were Democratic. The numbers began to converge in tiers 5, 6, and 7 with 20%, 24%, and 28% conservation standards respectively, but the numbers still favored Democratic districts. The three tiers, with a total of 181 water agencies, averaged 58% Democrat and 42% Republican Senate districts; 55% Democrat and 45% Republican for Assembly districts. But in tiers 8 and 9, with standards at 32% and 36%, the number of districts contained in each tier shifted drastically to the Republican side. Tier 8, with 54 water agencies, showed 65% Republican and 35% Democrat for Senate; 58% Republican to 42% Democrat in the Assembly. Tier 9, with 85 water agencies, showed 67% Republican and 33% Democrat for Senate; 55% Republican to 45% Democrat in the Assembly. Below are graphical representations of the Tier Study. 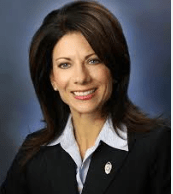 Assemblywoman Melissa Melendez of Lake Elsinore (R-67th) was so disturbed by the water allocations that she drafted a letter to Marcus, dated May 7, 2015, outlining her concerns. The letter was signed by Melendez, along with eight other Assembly members including Ling Ling Chang (R-55th), Tom Lackey (R-36th), Eric Linder (R-60th), Chad Mayes (R-42nd), Jay Obernolte (R-33rd), Marc Steinorth (R-40th), Marie Waldron (R- 75th), and the lone Democrat to sign the letter, Assembly member Cheryl R. Brown (D-47th). State Senators, all Republican, that signed the Melendez letter, included Bob Huff (R-29th), Mike Morrell (R-23rd), Sharon Runner (R-21st), and Jeff Stone (R-28th). Chairwoman Marcus, who has made herself readily available to the Los Angeles Times and Sacramento Bee for lengthy quotes pertaining to water conservation goals, has yet to answer Melendez’ letter. So what’s the problem here? Brown screws the republicans? What’s wrong with that? This isn’t personal, this is politics. Look at what Hilary had to endure last week. 11 hours of partisan politics…no problem, she handled it. Now the republicans in California will just have to pay more for water. What’s the big deal? ?